A new compound (chemical structure shown here) blocks the activity of an enzyme involved in glucose regulation. The discovery of a compound that slows the natural degradation of insulin in mice opens up a new area of investigation in the search for drugs to treat diabetes. The research team, which included David Liu and Alan Saghatelian of Harvard University, Markus Seeliger of Stony Brook University School of Medicine, and Wei-Jen Tang of the University of Chicago focused on insulin-degrading enzyme, or IDE. 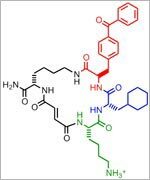 Using a method called DNA-templated synthesis, the scientists made 14,000 small molecules and found one that bound to the enzyme, suggesting it might modulate the enzyme’s activity. Work in test tubes and in animal models confirmed this—and showed that blocking IDE activity improved insulin levels and glucose tolerance. The researchers also learned that the enzyme is misnamed: In addition to insulin, it degrades two other hormones involved in glucose regulation. This work also was funded by NIH’s National Cancer Institute and the Office of the Director. A newly designed fluorescent biosensor shows where Rac1, a molecule involved in cancer metastasis, is active in this cell. 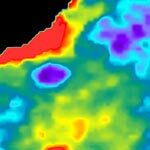 Warmer colors show greater Rac1 activity. Credit: Yasmin Moshfegh, Albert Einstein College of Medicine. Most of the more than half-a-million deaths caused by cancer each year in the United States result not from the original tumor but from the spread of cancer to new parts of the body, or metastasis. Cancer cells travel from a primary tumor using invadopodia, foot-like protrusions that break through surrounding connective tissue. Invadopodia are driven by protein filaments that repeatedly grow and disassemble. Exactly what guides this cycle was unclear, but scientists suspected a molecule called Rac1 might be involved. A new tool now sheds light on the details. Researchers led by Louis Hodgson of Albert Einstein College of Medicine developed a fluorescent biosensor that glows wherever Rac1 is active in a cell, and they used it to study highly invasive breast cancer cells taken from rodents and humans. The scientists observed invadopodia form when Rac1 activity was low and disappear when it was high. They then confirmed their findings when they shut down the gene that encodes Rac1 and saw the invadopodia remain intact indefinitely. This discovery suggests that targeting Rac1 activity with drugs could stop the spread of cancer cells. But a major hurdle remains: Healthy cells, including those that make up our immune system, also rely on the molecule for normal activity. Researchers must find a way to turn off Rac1 in cancer cells without disrupting its function in the rest of the body. 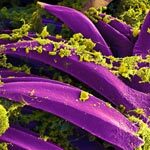 What looks like pollen on petals is actually bubonic plague bacteria on the digestive spines of a flea, viewed through a powerful microscope. Credit: B. Joseph Hinnebusch, Elizabeth Fischer and Austin Athman, NIH’s National Institute of Allergy and Infectious Diseases. Science. Art. Airports. I’ve never used those three words together before. But I’ve been doing it a lot lately while working on Life: Magnified, an exhibit of 46 striking scientific images created by scientists around the country using state-of-the-art microscopes. We’ve also set up an online gallery, where the colorful images can be viewed and freely downloaded for research, educational and news media purposes. The project itself was quite an adventure. When we asked scientists to send us images, our fears of not getting enough attractive, high-resolution options were drowned by a deluge of more than 600 submissions. Then we worried how to sort through them all and make final selections. Doing so required several rounds of online viewing, various ranking systems and a panel of experts. Then the images were printed as large, digital negatives on transparency film. The midnight installation of Life: Magnified involved five people (that’s me in pink), a ladder and lots of rags and glass cleaner. Credit: Woody Machalek. Dulles is a pretty busy place, so we set up the exhibit when it was quietest—the middle of the night (10 p.m. to 1:30 a.m., to be exact). 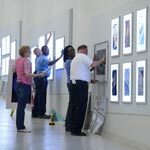 We swapped out images from the previous photography exhibit and installed the Life: Magnified ones in LED lightboxes mounted in the airport’s Gateway Gallery. It was an eerie and exhilarating feeling to be in a noiseless, nearly empty airport without heavy bags and a long walk to a departure gate. Less than 12 hours later, I was surprised to receive an e-mail from someone who had passed through the exhibit and sent a few photos. He called the images “stunning.” Similar sentiments were expressed by Science , NBC News online , The Atlantic , The Washington Post , National Geographic and other publications. Now I’m being asked about next steps, including whether the exhibit will travel. We’re investigating a variety of options. For now, I hope you’re able to see the exhibit in person. If not, take a look at the images online and see which ones you enjoy most. Imagine a landscape with peaks and valleys, folds and niches, cool, dry zones and hot, wet ones. Every inch is swarming with diverse communities, but there are no cities, no buildings, no fields and no forests. You’ve probably thought little about the inhabitants, but you see their environment every day. It’s your largest organ—your skin. 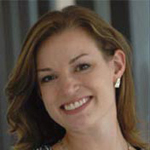 Elizabeth Grice, an assistant professor at the University of Pennsylvania, studies the skin microbiome to learn how and why bacteria colonize particular places on the body. Already, she’s found that the bacterial communities on healthy skin are different from those on diseased skin. She hopes her work will point to ways of treating certain skin diseases, especially chronic wounds. “I like to think that I am making discoveries that will impact the way medicine is practiced,” she says. To investigate what role bacteria play in diabetic wounds, Grice and her colleagues took skin swabs from both diabetic and healthy mice, and then compared the two. They found that diabetic mice had about 40 times more bacteria on their skin, but it was concentrated into few species. 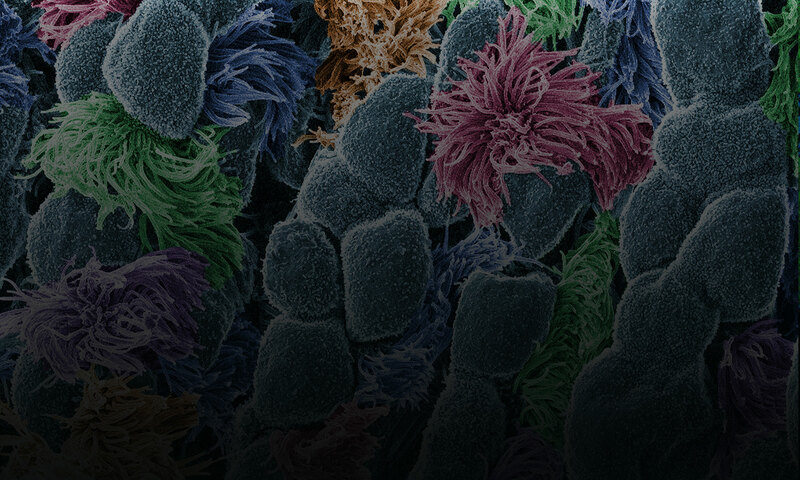 A more diverse array of bacteria colonized the skin of healthy mice. The researchers then gave each mouse a small wound and spent 28 days swabbing the sites to collect bacteria and observing how the skin healed. They found that wounds on diabetic mice started to increase in size at the same time as wounds on healthy mice began to heal. In about 2 weeks, most healthy mice looked as good as new. But most of the wounds on diabetic mice had barely healed even after a month. Interestingly, bacterial communities in the wounds became more diverse in both groups of mice as they healed—although the wounds on diabetic mice still had less diversity than the ones on healthy mice. Grice and her colleagues also found distinctly different patterns of gene activity between the two groups of mice. As a result, the diabetic mice put out a longer-lasting immune response, including inflamed skin. Scientists believe prolonged inflammation might slow the healing process. Grice’s team suspects that one of the main types of bacteria found on diabetic wounds, Staphylococcus, makes one of the inflammation-causing genes more active. Now that they know more about the bacteria that thrive on diabetic wounds, Grice and her colleagues are a step closer to looking at whether they could reorganize these colonies to help the wounds heal. Content adapted from the NIGMS Findings magazine article Body Bacteria. 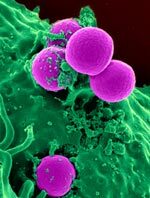 Antibiotic-resistant strains of Staphlyococcus aureus bacteria (purple) have become the most common cause of skin infections seen in hospital emergency departments. Credit: NIH’s National Institute of Allergy and Infectious Diseases. In the United States alone, at least 2 million people each year develop serious infections with bacteria that have become resistant to the antibiotics we use to combat them, and about 23,000 die, according to the Centers for Disease Control and Prevention. Antibiotic resistance can turn once-manageable infections into “superbug” diseases that are difficult—and sometimes impossible—to treat. Scientists funded by the National Institutes of Health are studying many aspects of antibiotic resistance, including how it spreads. Read this Inside Life Science article for just a few research examples and how the work could aid efforts to curb the emergence of resistance. An artistic interpretation of the human proteome. Credit: Corinne Sandone and Jennifer Fairman, Johns Hopkins University. Genes control the most basic functions of the cell, including what proteins to make and when. In 2003, the Human Genome Project created a draft map of our genes, and now researchers have completed a draft map of the human proteome—the set of all our proteins. The map, which includes proteins encoded by more than 17,000 genes as well as ones from regions of the genome previously thought to be non-coding, will help advance a broad range of research into human health and disease. 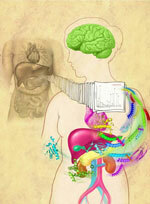 Read more about the proteome map in this NIH Research Matters article.